Now that school has started and our schedule is filling up, it is important for me to keep a freezer full of freezer friendly recipes ready to go for my family for busy weeknights. 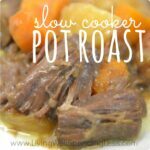 I especially love any recipe that I can throw in the slow cooker in the morning and have an entire meal waiting at dinnertime. 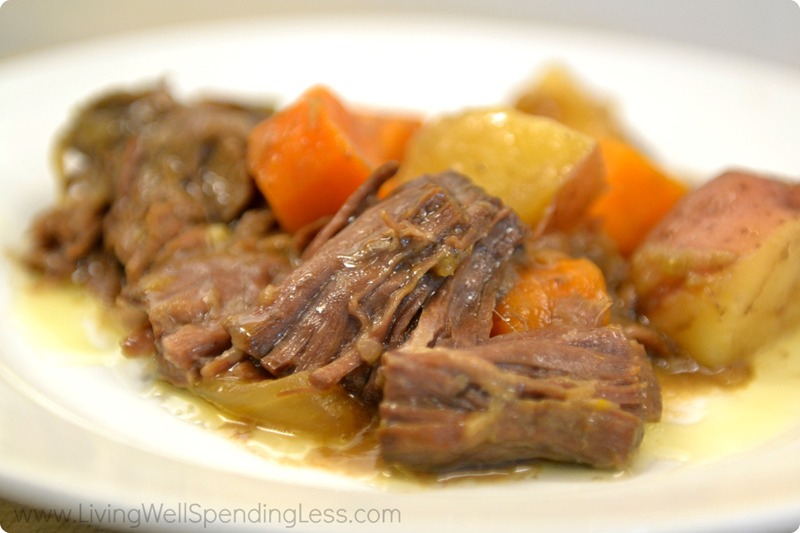 This super easy slow cooker pot roast is big on delicious flavor but light on time and effort, and let me tell you that this one scored a perfect 10 with my family! In fact, they rated this their favorite freezer meal thus far, which is really saying something! Please note that the recipe makes two whole roasts that you can freeze ahead of time for busy weeknights, and it is a great addition to any freezer cooking day. If you prefer to just make one roast, simply cut the recipe in half. On cooking day, you can throw in some chopped carrots, potatoes, and onion to make a complete meal, or simply make it all on its own. 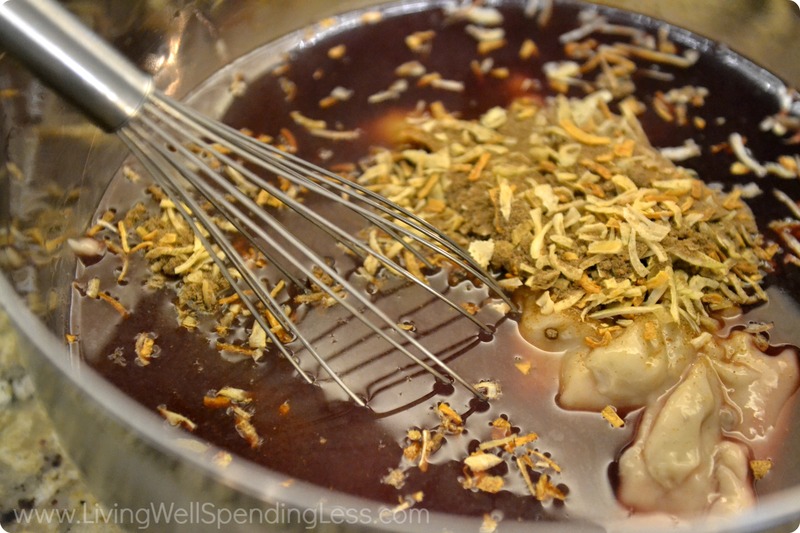 Step 1: In bowl, whisk together soups, soup mix, water, wine and broth. Step 2: Label bags, divide meat into 2 bags and pour marinade into each bag dividing evenly. Then freeze. 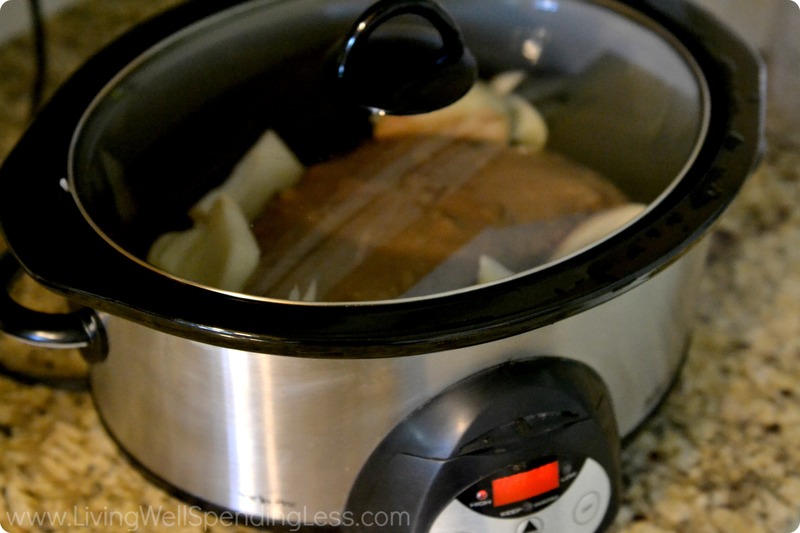 Step 3: Thaw, cook in crock pot on low for 8-9 hours or on high for 3 to 4 hours. *Optional- Add chopped carrots, onion and red potatoes to the crock pot after 2 hours. 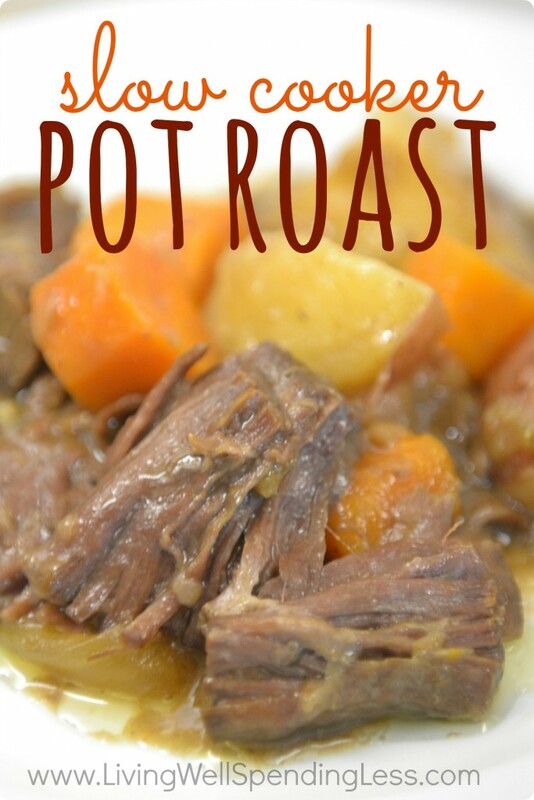 Staple ingredients make this pot roast extra tasty and oh so easy! In bowl, whisk together soups, soup mix, water, wine and broth. 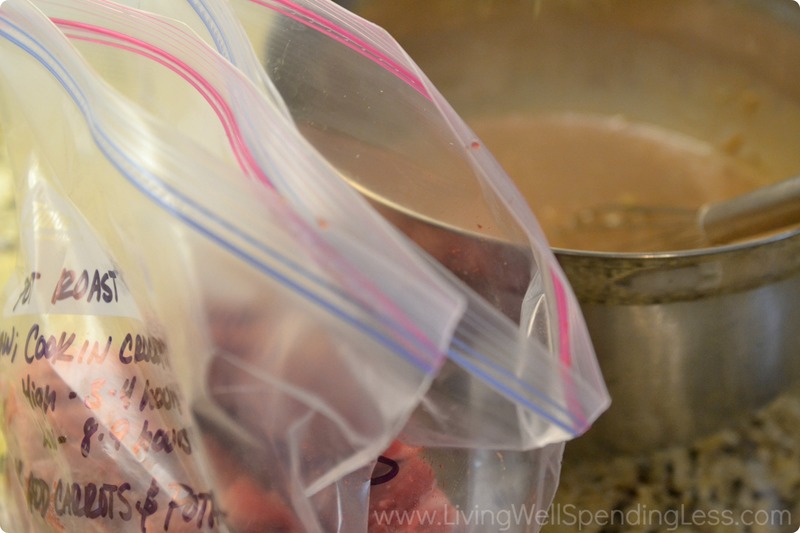 Label bags, divide meat into 2 bags and pour marinade into each bag dividing evenly. Then freeze. 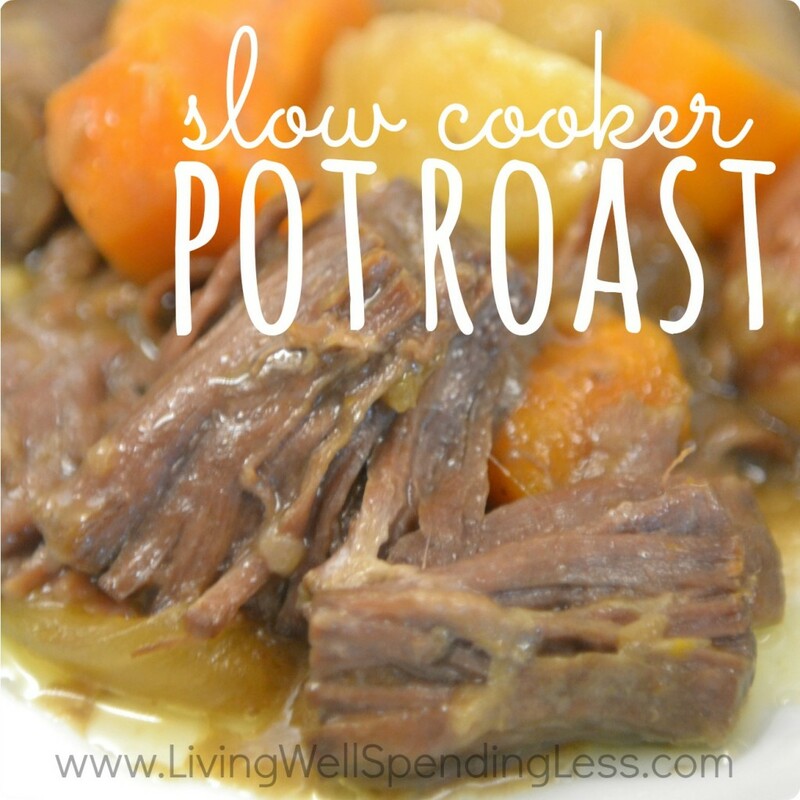 Thaw, cook in crock pot on low for 8-9 hours or on high for 3 to 4 hours. *Optional- Add chopped carrots and red potatoes to the crock pot after 2 hours. Looks delicisious! I will try cooking this over the weekend.. This sounds so good! Did you use red wine or red wine vinegar? Neither of us like wine so I wouldn’t have that on hand and was wondering what I could substitute. 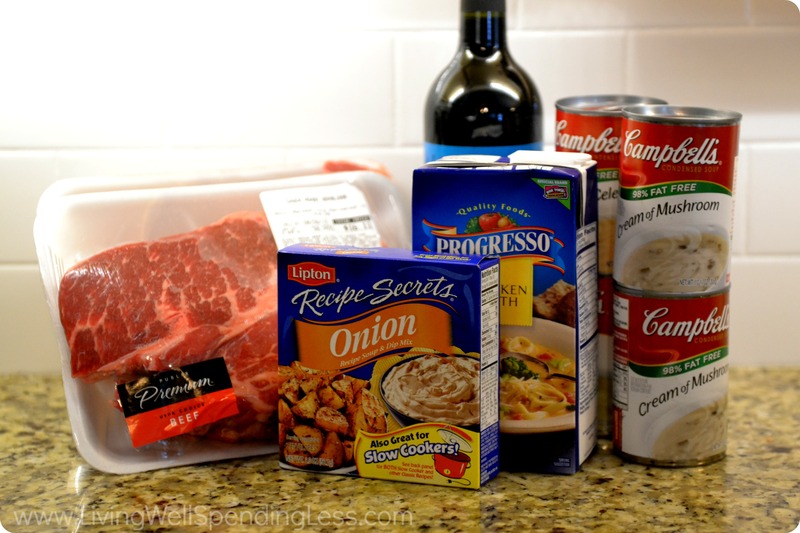 You can add extra broth if you don’t want to add the wine. I hope this helps! How long does it takes to the? Can I take it or at night, move it to the fridge, and put in the slow cooker in the morning? Or does it need longer?